There are tons of software available to recover and restore lost data from your computer and hard disk but what if you accidentally deleted something from your iPhone or iPad. Accidental Deletion, Damaged and Locked Devices always seems to trouble most of the iPhone users. 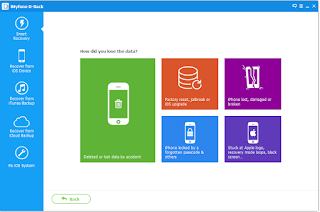 iMyfone heard all the problems and facilitated all the users with their Data Recovery tool for iPhones & iPads and other iOS devices. With this program, you can easily recover lost files, photos, videos and much more within few steps. 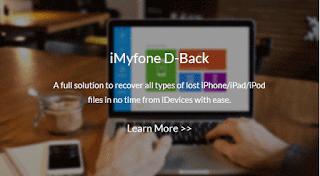 So, let’s start the review of iMyFone's D-Back Recovery Software, which can recover lost data from iOS devices. Launched in 2015, iMyfone is an upcoming software development company which is aiming to provide data recovery and other utility tools for iPhone Users and other iOS devices. With over 2 million happy customers, iMyfone has successfully provided various data solutions. They are best recognized for their ultimate iPhone space cleaner that magically frees up a lot of space from your device. You can check their other tools and software here. OK! Now, let’s get back to the Recovery software again. Frankly Speaking, this software is the beast of all recovery tools available in the market. Yes! The software is a paid one but with such premium features available, you’ll feel that it is worth of an investment. I’ll discuss the pricing and plans later in the review. D-Back is a performance oriented software that can restore and recover files and media from more than 22 types of extensions. 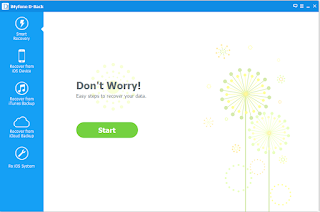 Whether you’ve accidentally deleted an important file, or your device got damaged, iMyfone's D-back recovery software always comes handy in these type of situations. You can retrieve lost data and media files from lost iPhones and broken devices. With just three steps, you can easily recover all the relevant documents, messages, photos and videos. The software is available for both Mac & Windows. You can easily install D-back on your PC or Laptop within few seconds. Losing your important files, data and photos are one of the most disastrous losses that any user would feel. Luckily, iMyFone’s D-Back is here to the rescue! The user interface is simple and provides an inclusive range of recovery options that can easily recover all your files within few minutes. You can download the trial version of the software from its official site. iMyfone D-Back for Windows can be downloaded from here for free. Furthermore, you have to license the software to use its full capabilities and recovery options. The Interface is very minimal, and you can quickly start recovering files from any of your devices. Please note that the software exclusively works with the iTunes. So, you also need to install iTunes along with the software. The recovery options that the program provides are fantastic. 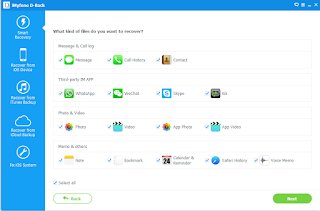 You can recover chats, call history, contacts, WhatsApp Messages, Photos, Videos, Notes and much more. The app seamlessly works with all the main iOS devices and can even restore data from bricked devices. Compatibility & Reliability: - The software is super compatible. You can restore all the data from all the major iOS devices. iPhone SE, iPod touch 5 and iPad Pro, this tools supports all the latest devices. Preview Function: - D-Back comes with the preview option so that you can quickly preview all the files and you can easily select which file to recover from your device. Smart Recovery Option: - This option is best for the beginners. So, if you don’t know anything about recovery tools, then you can choose on quick recovery which itself scans the whole device and then recovers files. Availability & Security: - iMyfone also emphasizes on additional recovery options. One can recover data from iCloud Backup, iTunes Backup and much more. Furthermore, all the information retrieved would be available to the user without comprising with the quality. Screencast & Looped Recovery Options: - Don’t worry if your device got bricked or damaged during update or booting. D-Back allows you to quickly all the critical data from the phone. Also, it has a screencast option which enables the user to restore data if there are at blacked out, boot loop. 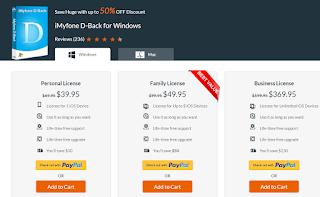 iMyfone’s D-Back Software is a premium recovery software but with such amazing features and restoring options; it is worth buying. The pricing for the basic license is $39.95, with lifetime support and extension updates and pricing for the Mac variant is also the same. Moreover, the recovery license is also available for Family & Business license too. I recommend the family license as it can recover up to 5 iOS devices for a price of $49.95. All in All, iMyfone did a fantastic job by providing a recovery software for iPhones and other iOS devices. D-Back is a premium software which can recover and restore files from damaged iOS devices, accidental deletions, and corrupt devices. So, this was the review of the recovery software. Do share your thoughts below and let me know for any suggestions with the software or the article.